Jean Paul Gaultier will launch Kokorico By Night in September. The new fragrance for men is a flanker to 2011's Kokorico. 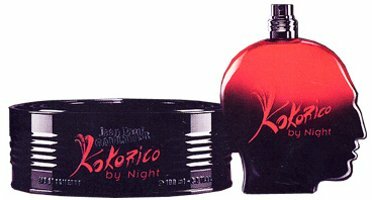 Kokorico By Night features notes of bergamot, rhubarb, cocoa bean and tonka bean. Jean Paul Gaultier Kokorico By Night will be available in 50 and 100 ml Eau de Toilette. It will have been about a year, which seems to be the usual now! It hasn’t even launched in the US yet though. I wanted to like Kokorico but I don’t. Still have a Sephora-made sample somewhere. Nothing annoys me more than when they’re about to release a flanker and the first one hasn’t even made it to the United States yet. Agree — they’ve really taken their sweet time with this one. The can looks like it should contain tuna or cat food. The profile bottle is awful. It could only be worse if the spray came out of the nose. Thank goodness for small favours. I like the bottle. I find the profile to be a bit Cocteau-esque. Then, seen “sideways” (which would be “face-on”) you get the exact profile of the Le Male bottle. Yes, I thought the bottle was ludicrous until I saw the side view. Clever. I want to buy a Kokorico but everytime I end up getting something else, I even left a can at the register…. and yes, this is too early for a flanker I think. Light me up, isn’t Kokorico somehow close to L’Instant? Wow ! Super surprised ,the original has only been released in Sydney Australia not two weeks ago ! I too would never buy this due to the hideous bottle ! it really is a shame as I admire JPG as a revolutionary designer ! The juice is nice, have u noticed the similarities between this and the flanker to Bang – Bang bang? Next !!! Sorry for the mistapes and bizarre grammar..
Its available in the states well miami. its nothng special its in the same range as ck one shock. it goes for $50 at the place i get it at. dnt worry ur not missing out on anything. I haven’t even tried the current version! This head seems to be burning! Already? Did the original do well?